Brandon Brooks celebrates his huge signing bonus. A little over a month ago, the Philadelphia Eagles re-structured the contract of Lane Johnson, when they converted his salary into a signing bonus, freeing up $7.5 million in cap space. According to Field Yates of ESPN, the Eagles have done the same with Johnson's partner on the right side of the Eagles' offensive line, RG Brandon Brooks, this time freeing up another $6.37 million in cap space. 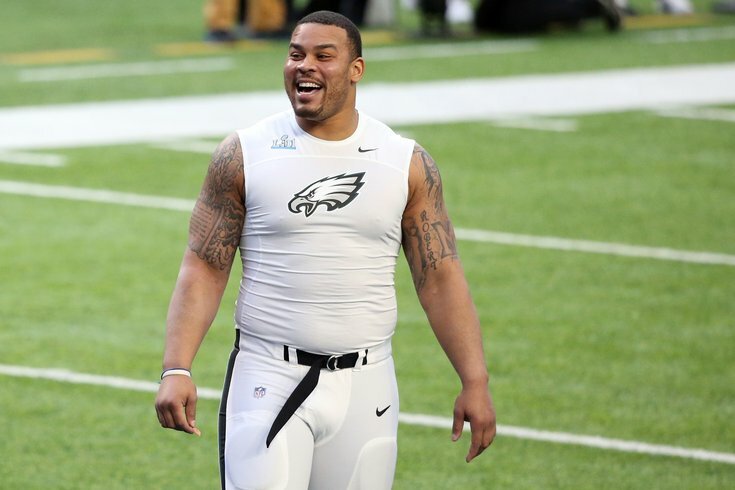 Source: the Eagles created $6.37M in cap space by reworking the deal of Pro Bowl G Brandon Brooks. He converted base salary into bonuses, dropping his cap number to $4.768M for this year. Brooks made the Pro Bowl for the first time in his career last season, as he and Johnson formed unarguably the best RG-RT tandem in the NFL. Obviously, Johnson and Brooks will be a big part of the Eagles' offense for the foreseeable future, so adding money onto their contracts down the road, thus making them more difficult to cut, should not be a worry for the Eagles' front office. The worry instead lies in the fact that they will now carry bigger cap hits down the road. For now, Howie Roseman has an extra $6-plus million in spending flexibility.